Don't let the popularity of trekking to the top of Volcan Villarrica put you off. One of very few volcanoes to boast of an active lava lake in the crater, climbing Villarrica is an extraordinary experience. The slog up to the top all becomes worthwhile as you peer into the mountain's blistering depths, before an adrenaline-filled slide back down the slopes in a fraction of the time it took to ascend. Unless you are a qualified mountaineer, you will have to join a guided climb. Although technically not particularly difficult, the climb does require a reasonable level of fitness. In addition, weather conditions can change dramatically in a very short space of time and there is a risk from the sulphurous gases emitted at the crater, both occasionally contributing to an early finish to the walk. Snow-capped Volcan Villarrica perches calmly above the resort town of Pucon, its benign appearance belying the wrath bubbling away at its core. The most active volcano in Chile, this monolith was named Rucapillan (roughly translated as "House of the Pillan") by the native Mapuche tribe: in Mapudungun mythology, the "Pillan" punished the populace with destructive natural disasters. Experiencing the volcano from up close is a formidable reminder of the sheer power of nature. A raw, harsh wind can take hold on the exposed, permanently snow covered, slopes: battering hands and faces with sharp pellets of ice, and driving walkers back off the mountain. At the crater, the rumbling vibrations from the mountains heart often sound out its insistent warning and poisonous gases permeate the atmosphere, whilst the dark, viscous top coat of the lava lake occasionally spurts jets of molten rock from its surface. 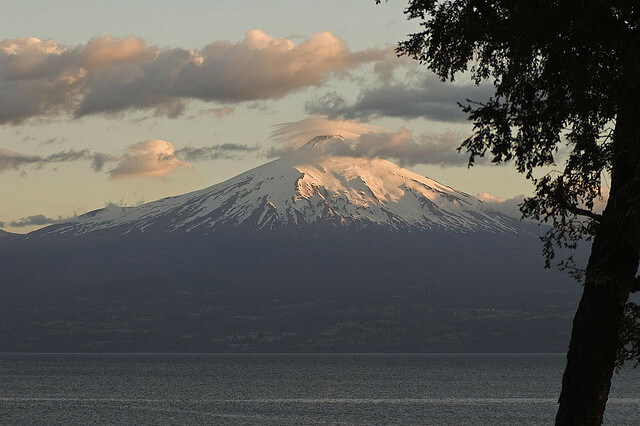 The earliest recorded eruption of Volcan Villarrica was in 1558, shortly after the arrival of the Spanish in the area. Since then there have been at least 65 eruptions, with the two most recent of any significance occurring in 1964 and 1971 - in the latter, at least 15 people were reported to have died. Much of the damage to buildings in both of these years was caused by lahars, flows of volcanic debris mingled with rocks, mud and water; phenomena which the volcano is particularly prone to as eruptions thaw areas of heavy glaciation and perennial snow cover. Faced with the fuming brutality of the mountain, it is perhaps with relief that walkers will turn their backs on Volcan Villarrica and skim down its mountainside at considerable speed. Known as 'glissading', this adrenaline-filled method of descending the volcano is only possible when there is enough ice on the path down, so take this into account in deciding when to do the climb. Also bear in mind that the first couple of hours of hiking (a bit of a drag through a ski resort) are necessary in winter but avoidable in summer, when the ski lift is open for climbers. Conaf, Chile's National Forestry Corporation, stipulates that those without proven mountaineering qualifications must be accompanied by a guide. Although their definitions of 'qualified' are not entirely clear, and enforcement is apparently lax, given the unpredictable conditions on Villarrica an experienced guide is strongly advisable. There are numerous companies, and tours can be booked in Pucon before you get to the park; guided climbs will include hire of mountaineering equipment, which will certainly be necessary. In addition, ensure you have some eye protection, such as snow goggles or good sunglasses, to prevent snow blindness. Although the best guides will cater for varying fitness levels, you will need to be reasonably fit. It is worth doing some research to find the best-regarded guides as they can make a difference to how enjoyable, and potentially how safe, your trip is. Above all, approach the climb responsibly: this is an active volcano, its summit draped in glaciers and deep snow, with a challenging climb to the top and with unpredictable, rapid weather changes. There are real dangers involved and tourists have been killed here. If you want to see more of Villarrica NP then consider the challenging Villarrica Traverse, a multi-day walk skirting the volcano and continuing southeast to the Argentine border. For more information and photos, including detailed practical information and some warnings, see our Villarrica NP walk page.